Successfully Added Wall Climbing RC Toy - Lady Bug to your Shopping Cart. This great new wall climbing RC Toy gadget certainly kicks it up a notch! 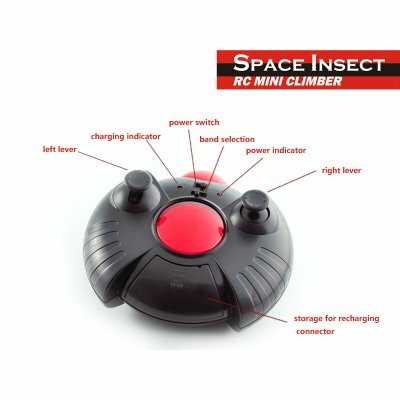 Its insect characteristics along with being able to drive it on walls and ceilings makes this anti gravity RC toy the perfect Halloween and novelty gift for anyone. The wall climbing Lady Bug RC toy runs off a rechargeable internal battery that can be charge via the IR remote controller. The IR remote control runs off 6 AA batteries (Not Included), along with two joy stick controls for versatile maneuverability that gives the Lady Bug RC Toy the naturalistic maneuvering features that makes it special. To consume battery power, the wall climbing RC toy comes with two mode functions. Turn the switch right to the (W) sign, and the suction that enables the Lady Bug RC Toy to stick to walls and ceilings will be activated. Alternatively, you can turn the switch left and use this function when only operating the RC toy on the floor. Fabric skirts and a powerful fan create suction that lets the lady bug rc toy drive along walls and ceilings. Will this RC Toy work on the walls of my home / office / dorm? This RC Toy works best on flat, clean, uninterrupted surfaces. I tested out this toy before i sold any. My grandchildren of 6 and 7 just could not stop playing with it. It light up, will only work on clean surfaces, not interrupted surfaces, which i alreaady knew before i bought it. It is an amazing toy and i would highly recommend it.